Spoken as fires of rage and frustration wrecked huge swaths of Los Angeles, the plea distilled centuries of racial strife into a challenge - and a goal. Today, the various answers to his question measure the lasting significance of King, who died in California Sunday after he was found at the bottom of his swimming pool. He was 47. "It was a critical question at a moment of crisis that forged our human bonds with one another," said Georgetown professor Michael Eric Dyson. "It grew up out of the hope and the desire, especially of people of color, to see this nation come together." And it came from an unemployed construction worker who, through an accident of history, now stands among the unforgettable names of America's racial journey - names like Emmett Till, Medgar Evers, and even larger figures who died too young. 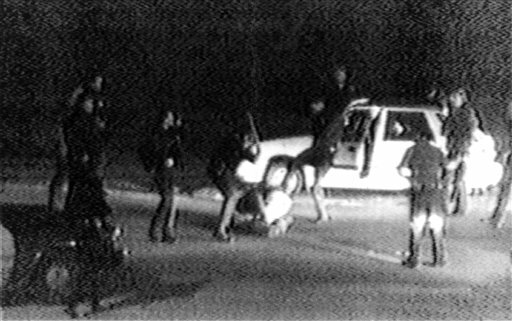 The nation first saw King as a black man curled up on the ground by his car, being beaten by four white police officers. On parole for a robbery conviction, he had been drinking, then speeding, and had refused to pull over. Police finally pulled King from his car, then struck him more than 50 times with batons and boots. One of King's legacies is that he raised the curtain on the video age: If a man had not stepped outside of his home and videotaped the beating, King would have been lost to history. "The biggest impact was that it was actually on tape," said Dom Giordano, a talk radio host in Philadelphia. "It was so rare, except for something like Bull Connor, to have this type of footage." King became an enduring symbol of police brutality - proof positive, to many people, that the dogs and fire hoses loosed by Connor, the Birmingham police chief, on civil rights marchers in 1960s Alabama had merely been updated, not eliminated. "He represented the anti-police brutality and anti-racial profiling movement of our time," the Rev. Al Sharpton said Sunday. The videotape was the central piece of evidence at the four officers' trial, which became a classic piece of modern racial drama. Did King bring the beating on himself by resisting arrest, symbolizing that black people blame racism for the consequences of their own actions? Or was there an ingrained police culture of violence against black people, backed by a system designed for black people to lose? There were no blacks on the jury in the predominantly white suburb of Simi Valley, Calif. After the police were acquitted - one got a mistrial - Los Angeles was engulfed in a fiery uprising that lasted three days, killed 55 people and injured more than 2,000. "There was the articulation of a pent-up rage that had not been heard before," Dyson said. "A sense that we do count, a sense that you're going to pay attention to us." Yet many viewed it as a spasm of lawless, pointless self-destruction, with much of the damage done to black areas. The aftermath highlighted a fundamental division in the way justice, and progress, is often viewed through the lens of race. "I don't think white America said, now we have to make changes because they rioted," said Giordano. Instead, he sees change as a result of people living, working and starting families with other ethnicities. Can we all get along? Giordano says yes. "What has changed is more the meat and potatoes, day to day things," he said. "For every instance like a Trayvon Martin, I do see things routinely that indicate that we are getting along, that we are moving past racial tensions." A few weeks ago, Giordano had King on his show, which draws a largely conservative audience, to promote his new autobiography. Nobody called in to revisit the trial or to say that King deserved what happened to him. "That's progress," Giordano said. "I think the audience would have rejected him 20 years ago." But Michael Coard, a Philadelphia attorney and activist who has brought numerous police brutality charges against police, is not so hopeful. "That videotape showed white America what black America already knew," he says. "But the sad part is, it showed what white America has been and still is in denial about." Coard named several unarmed blacks who were killed by police in the past 20 years - Amadou Diallo, Elanor Bumpurs, Sean Bell, and others. "Nothing has changed," he said. But what about the election of the first black president? "Barack Obama had to get Secret Service protection before any other candidate," Coard responded. "He got four times the amount of death threats as George Bush. Why is that?" "The video and the verdict grabbed America by the throat and said, what are you going to do about this?" Coard said. "And the answer was, not a damn thing." Los Angeles' police department certainly changed. Years of investigations revealed corruption and "a significant number of officers in the LAPD who repetitively use excessive force," according to a federal government report. The Justice Department forced the LAPD to implement reforms. "Some good came out of a very tragic situation. There have been positive changes," said Loyola Law School professor Laurie Levenson, a former federal prosecutor who attended the officers' trials. "(King) himself was never viewed as a hero. But what happened in that case changed the LAPD and Los Angeles forever. And what about the nation? Did it heed King's challenge? "The jury is still out," said Dyson. He places King's question alongside some of the seminal black expressions of the past century, from W.E.B. DuBois identifying "the problem of the color line," to Martin Luther King's "I have a dream" and Malcolm X's "by any means necessary." "You ain't got to be highly educated and deeply connected to a bourgeois black infrastructure," Dyson said, "to make a statement that articulates and summarizes the hopes, aspirations, dreams and determination of a people."